Posted on May 30th | Written by Industrial Refrigerated Systems Ltd. 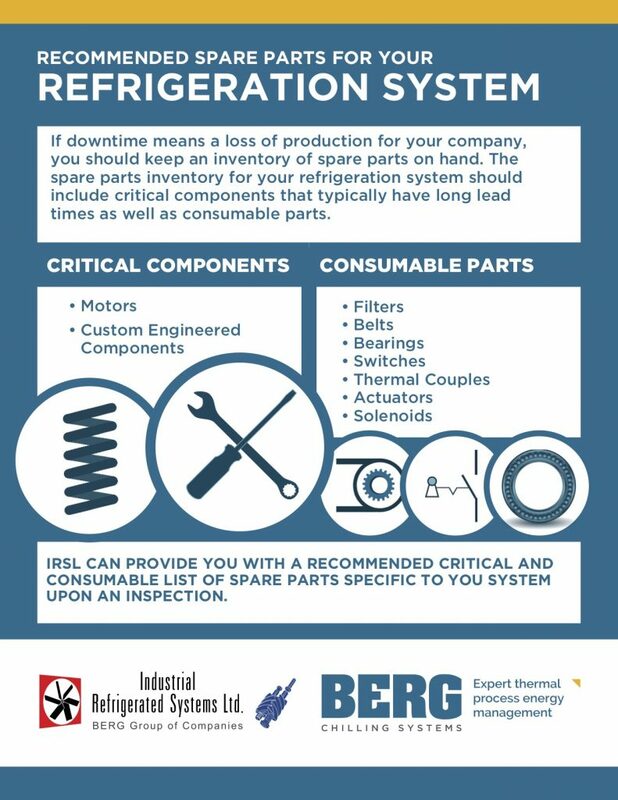 If downtime means a loss of production for you company, you may want to consider keeping an inventory of spare parts for your refrigeration system. While purchasing spare parts may seem like a large expense upon initial purchase, their costs are minuscule compared to the cost of downtime. A production facility learned the importance of spare parts the hard way. During production a set of grate bars required immediate replacement. With no spare parts on hand they were forced to order the parts at an expedited cost, which still took more than three days to arrive and be installed. If the production company kept a stock of spare parts, they could have avoided the expedited cost of the parts and avoided lost production time. If a part is defective you can mitigate downtime by having spares available for replacement right away. Avoiding the cost of loss production and the cost of expedited emergency parts. Having an inventory of spare parts allows companies to get their operation back on the line quickly, avoiding lost time and wages while waiting for a spare part. In an effort to avoid major shut-down it is common for company employees to perform a “patch job” on the equipment. In our experience this usually results in further damage to the machinery or caused it to malfunction in a way that impacts product quality. Do I need Spare Parts if my Refrigeration System is New? Regardless of whether your refrigeration system is brand new or old we recommend that you keep a stock of spare parts. While newly installed equipment should be perfectly functioning with quality parts there is always the possibility for part failure. On the other hand, if your refrigeration system equipment is older, replacement parts can become difficult to obtain. This can be especially true on short notice. It is inevitable that equipment will fail, calculate your risk. We explain how to do this in the next section. Work with your Operations Department to ensure that your budget includes funds for spare parts. Identify which machines will have a compounding impact on production and the equipment that you can least afford to have out of production. This will help you prioritize which equipment you need spare parts for. Utilize information from Equipment Vendors to determine which parts are harder to get and how long they can take to get delivered. This will help you determine the priority of spare parts. Research the costs involved in purchasing and storing replacement parts. Compare that to the cost of purchasing and storing replacement parts. Based on this analysis you can make an informed decision about your downtime risk. Creating a well-organized, well stocked spare parts inventory will ensure less downtime. A recommended spare parts list should include critical components that typically have long lead times as well as consumable parts. IRSL can provide you with a recommended critical and consumable list of spare parts specific to your system upon an annual inspection. Costly repairs and downtime can also be avoided by performing regular maintenance on your refrigeration system. There are some maintenance tasks that should be performed routinely while there are other that should be done annually. You can keep track of these refrigeration maintenance tasks by using IRSL’s Refrigeration Maintenance Checklist. Contact IRSL for any of your refrigeration system needs or questions about recommended spare parts.